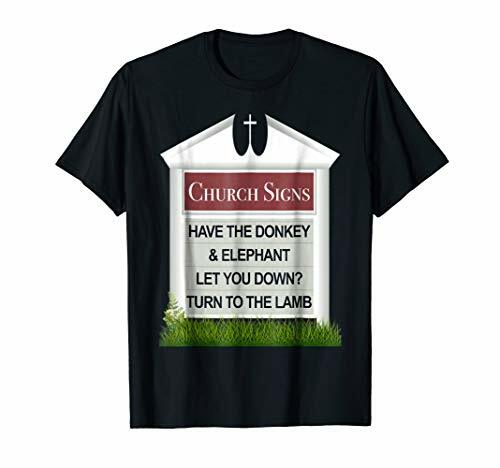 Church Sign T-Shirts, Donkey & Elephant let you down? Have the Donkey & Elephant let you down? Turn to the Lamb T-Shirt. Designed like a funny or inspirational Church sign. Great shirt to wear to Church or Church picnics, Church softball games. Inspirational Quotes. Tshirts for Christians and all Religions. Great gift idea for, clothing, T-Shirts for Men, Women, Dad, Mom, boys, girls, kids, family friendly, College Students, religious, Jesus fan, God Believer, Bible believers, Bible readers, Pastors, Sunday school teachers, funny Christian saying T Shirt. Have the Donkey & Elephant let you down? Turn to the Lamb T-Shirt. Designed like a funny or inspirational Church sign. Great shirt to wear to Church or Church picnics, Church softball games. Inspirational Quotes. Tshirts for Christians and all Religions. Great gift idea for, clothing, T-Shirts for Men, Women, Dad, Mom, boys, girls, kids, family friendly, College Students, religious, Jesus fan, God Believer, Bible believers, Bible readers, Pastors, Sunday school teachers, funny Christian saying T Shirt. If you have any questions about this product by Christian Faith-based T-Shirts by King Novelties, contact us by completing and submitting the form below. If you are looking for a specif part number, please include it with your message.